The web site TeachersPayTeachers is having a sale right now, in honour of Teacher Appreciation Day in the United States. It starts today and runs through the May 9th. Lots of teacher-authors will be discounting their entire stores or selected items up to 20%, and then you can use coupon code TAD12 to get 10% more off upon checkout. You do need a free account to download free or paid items. Don't already have a free membership? I'd love it if you use my Referral Link to get signed up either as a buyer or a seller (still for free!) if you envision yourself uploading some original materials there some day in the near future, or cleaning out your gently used teacher materials cupboards ... maybe on some downtime this summer? I also know that there are also about 130 teacher-authors each making one product which is regularly priced $3-8 FREE for one day only (Sunday)... 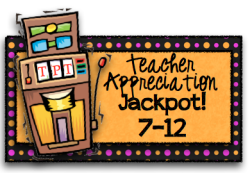 Welcome to the Teacher Appreciation Jackpot, which is in effect for TODAY ONLY! Find out more about that here if you want junior materials or here for intermediate! Happy shopping! PS: There is a primary link as well, so poke around on the other two blogs linked above if you are interested in great free resources for that level!